The search for Bigfoot continues in Branson and you can join the effort. At Bigfoot on the Strip, you have a variety of activities from which to choose, including the opportunity to scour the countryside in hopes of spotting the elusive beast. Before that, though, get your adrenaline pumping at one of the busiest activity centers in the Midwest. 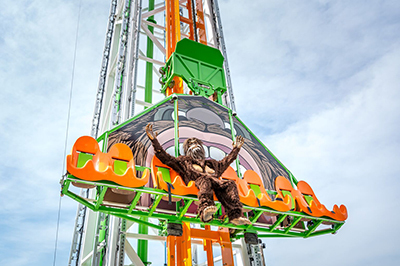 At the 200-foot high action tower, check out both the Gravity Bomb free-fall adventure and the heart-pounding Super Sling ride that sees riders shoot into the air in a saddle seat then descend end-over-end on their way back toward the ground. More fun awaits when you test your putting skills on the mini-golf course, take your best shot at the ill-tempered creatures in the 8D theater experience, have fun in the arcade and at the Yeti Play Zone and Monkey Jump. Still, it’s the search for Bigfoot that’s perhaps the most intriguing for visitors. Seated alongside fellow adventurers during a tram ride that’s unlike any other, you roll through varying terrain all the while keeping an eye out for the mythical Bigfoot. While there’s no guarantee you’ll see Bigfoot, one thing you can count on is a unique interaction with Scottish Highland cattle that occupy some of the territory over which you pass on your one hour, 20-minute outing. And as a member of the Bigfoot Search Club, it’s up to you to stay alert along the way. After all, you don’t want to be caught off guard – or without your camera ready – if Bigfoot approaches. Admission prices vary by activity; be sure to check the website for hours of operation and special deals. Make Bigfoot on the Strip part of your next Branson getaway, and if you happen to capture a picture of the beast, be sure to share it on social media using #ExploreBranson.